I've heard it mentioned once in a blue moon, but I can't tell if it's an actual product sold by a company, or a formula for something you mix yourself. 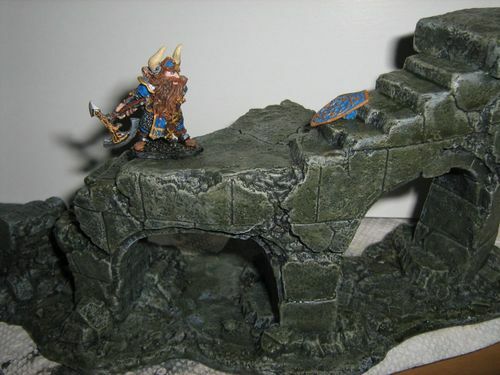 Looks like the perfect way to finish up your terrain projects. In pictures I notice lots of greenish brown tones in the wash, with a gray-tan base color underneath. So, what's the darn secret? Who do I have to torture? Is it some product that is no longer made and, if so, is there a DIY equivalent that produces similar results? Your google fu is weak, grasshopper. Here you go. Wow, so it's an actual product! 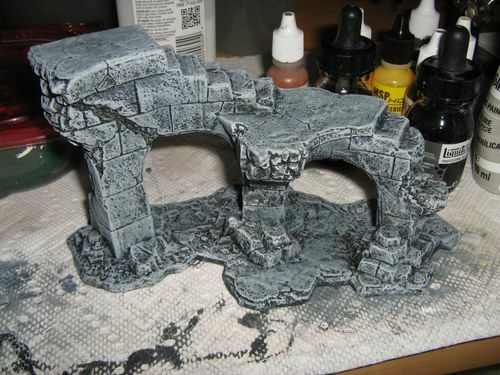 It's been a long time since I thought about terrain with stone work, much less how to paint it realistically. Those other pictures look excellent! I am definitely adding this line of products to my shopping list. Fantastic results. The Warstore carries Secret Weapon washes. I use them and I am very happy with them. Armour wash is my favourite. It's brownish/black and makes armour look a little oily. Secret weapon worked with Les and made a great product. I do have one, golden brown, that has flecks of metallic in it – not at all sure what that one is for. Jwebster: "Armour wash is my favourite. It's brownish/black and makes armour look a little oily"
I noticed in my original post that the stone wash wash had a slight sheen to it. So do all the inks make the surfaces shiny? And, if so, what sealer could one use afterwards to remove the shine without damaging the color effect? Most inks should not leave a shiny surface, I use them all the time and have no issues. I do Dulcote after I am done though. I remember in the 90s, Citadel inks always left a shiny finish. (Not sure about what they sell now.) This is partly why I started using a matte lacquer on top of clear coat. Les Bursley's washes are based on Daler Rowney inks mixed with Liquitex acrylic Matte Medium. I am not sure of the finish of Daler Rowney inks. Acrylic medium is normally glossy (Liquitex's is also their gloss varnish.) Matte medium has a matting agent added to acrylic medium that interferes with transparency to produce the matte effect. So try mixing the inks thoroughly. It may be the matting agent has settled to the bottom. It'll be purer and have less fancy stuff in it intended to "cut grease" than the stuff you use on your dishes but the very cheapest sort of detergent will do the same job but cheaper. My preference is windscreen wash though. This is a cheap source of isopropyl alcohol. And I think some detergent. But in any case it removes the surface tension at least as well as flow aid. Johnsons klear is also a reasonable cheap source of acrylic to "carry" your ink. Klear is just very thin gloss acrylic varnish so if you already have some varnish or medium you're not using then that would be more than find. It'll just be more expensive if you go buy it. Pledge Floor Gloss, from Wal-Mart, in the USA, is basically gloss acrylic, without any pigment. Add the acrylic paint of your choice to it, and you have, Magic Wash, of any color desired. As discussed, hit it with a matte clear coat, to remove the shine. The Dip (Minwax Polyshades Urethane Stain -- brush it on, rather than dipping the figure into the can; stir thoroughly, as the pigment settles heavily in the bottom of the can), is very similar in effect. The two colors I use are: Royal Walnut (dirty brown), and Tudor (black). I use the Satin finish, but it still needs a dull-coat after it dries. Both of these products are relatively inexpensive. They each have their purposes and applications. Custom colors require Pledge Floor Gloss; the majority of normal troops can be 'washed' with Minwax Polyshades Urethane Stain Royal Walnut, to give them that, "in the trenches"/"in the mud", look. With both techniques, watch for excessive pooling. I use the edge of a paper towel, or a paper napkin, to soak up the excess. The Pledge Floor Finish will dry within 20 minutes -- watch for pooling in the first five minutes… The Minwax will take a couple of days to fully dry; check for excessive pooling after 10-15 minutes; to be safe, do not touch the figures for two days, or you may leave your fingerprints permanently in its surfaces… Cheers! The Rowney inks do come out a bit glossy, and I find washes based on them do too. I use a matt varnish anyway so it's not a problem to me. I have an airbrush and use Vallejo polyurethane acrylic varnish.